The first Pilning station opened in 1863 on the new line from Bristol Temple Meads to New Passage Pier, where passengers bound for South Wales had to change for the ferry across the Severn. This line ran slightly north-east of the present one through the Tunnel, which did not open until 1886, when the old line closed to passengers and a new Pilning station opened on the present site. 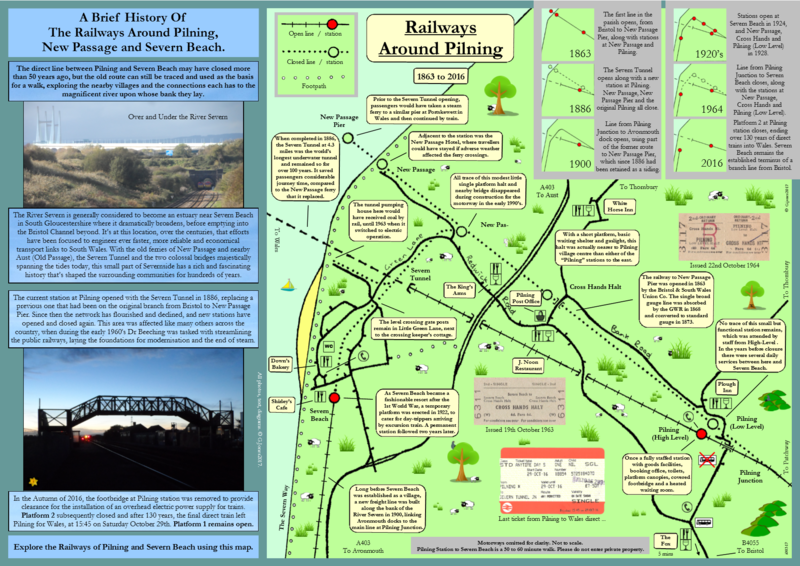 The old line remained in situ and was eventually extended round to Severn Beach for goods traffic, but passenger services over this section did not commence until 1928, when a simple halt was opened on the site of the original station named Pilning Low Level. Similar halts were also opened at Cross Hands and New Passage, and the main line station became Pilning High Level, reverting to simply “Pilning” in 1968 when the Severn Beach service was withdrawn and the Low Level halt was closed. The 1886 Pilning station had a good-sized main building on the eastbound (Bristol-bound) platform, housing the stationmaster, ticket office, parcels office and toilets, and a much smaller waiting shelter on the westbound side. Both were constructed of wood, and bore no similarity to any other stations on the line. At the Bristol end of the eastbound platform there was a small goods shed, and the station also had several sidings. In addition, it boasted no fewer than three signal boxes. As a result, there was quite a railway community based here – by 1903 these numbered a stationmaster, fourteen signalmen, six signalmen/porters, six porters, two “lad” porters and a tunnel inspector. Contrast today, when the place is deserted! Pilning station also had the distinction for some years of being the eastern terminal of a car-ferry train service running through the Tunnel to/from Severn Tunnel Junction. This provided an alternative for motorists to the Aust Ferry or the long detour via Gloucester in the years before the Severn Road Bridge opened in 1966, but using it was a challenge to say the least. Persons wishing to avail themselves of the service were advised to contact the station in advance “by letter, telegram or telephone (dial Pilning 206)” as only 22 cars could be conveyed on each train and they only ran two or three times a day. Cars had to be driven onto flat wagons positioned in a loading dock on the Bristol-bound side of the station – drivers had to release the pressure in the petrol tank by unscrewing the filler cap then tightening it again, and also had to run their engine until the carburettor was exhausted and the engine stopped automatically (impossible with modern vehicles). Motor cycles with sidecars (more senior readers may remember these) could also be conveyed, but no more than two pints of petrol was allowed in the tank. Waterproof sheets could be hired to cover the vehicles, and the fare for each car was 15 shillings (75p) one way and 25 shillings (£1.25) return. Drivers and passengers rode in carriages attached to the train. Unsurprisingly, the opening of the Severn Road Bridge was the service’s death knell and it ceased not long afterwards. Pilning station then embarked upon a long and steady decline. By the early 70s it was unstaffed and the wooden station buildings were boarded up and semi-derelict. By the late 80s they had been replaced by metal “bus shelters” and the service had dwindled to one train each way daily on Mondays to Saturdays (the Bristol-bound train was withdrawn for a time until protests forced its reinstatement). Trains were unable to call after dark because the station lighting had been declared unsafe and was disconnected. The service was further cut to Saturdays Only in 2006, and the “one train in each direction” became “two trains in one direction” in November 2016, when amid great controversy the footbridge was demolished and the westbound platform closed. However, these developments have not gone unchallenged, and since the mid/late 80s local people have been campaigning for services to be restored and improved – activity which has increased greatly in recent times, fuelled by justified anger over the footbridge demolition and the underhand way in which this was carried out. For further details see the “Battle for Pilning” section of this website. The fight goes on! (With thanks to “The South Wales Direct Line – History & Working” by P D Rendell (Crowood Press, 2014) for much of the above historical information. An excellent book, recommended to anyone with an interest in the history of this line).